Is your bathroom feeling a little bit dated and old-fashioned? Then perhaps its time to give your bathroom a little makeover to make it look good again. One simple way to do this is by changing your bathroom vanity counter which will instantly transform the style of your bathroom. Don’t know where to start? Get inspired by these stylish vanity counters. Create the luxurious spa feel by installing this elliptical vanity counter with a shallow basin that is hung on the wall and has rich wooden graining on it. The dark walnut colour looks both elegant and modern. If you have a bathroom that is less spacious, then this cute little vanity counter might be just what you need. Complete with drawers so that you can store things away to keep it looking neat, it is versatile and can match most bathroom styles. If you have the space, going for a bigger vanity counter fitted with two taps is a great idea because then you won’t have to fight over who gets to use the bathroom first. Besides, the warm wooden slats at the front of the counter looks really charming and classy. Relive the glamorous bygone eras by installing an elaborately carved and deeply coloured wooden vanity in your bathroom which comes with a matching basin that will look gorgeously unique. This intricate vanity is bound to be a statement piece in your bathroom. This is one of the best vanity counters you can get if you are a beach lover and loves anything to do with the sea. The light sand colour framing the mirror and the cabinets of the vanity match perfectly with the baby blue walls to evoke a sense of the sea. The marble countertop adds much needed elegance. 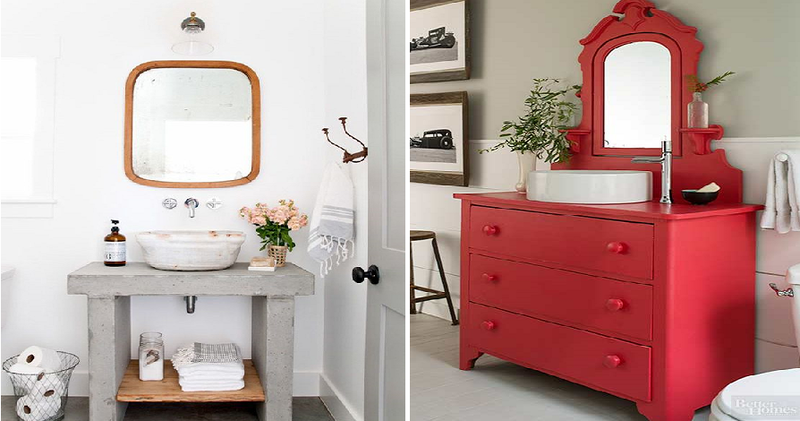 Getting a vanity counter in a bold colour may just be the best decision you have ever made for your bathroom. Paired with a white sink, it immediately looks super stylish, especially with the majestic looking detail on top of the mirror. Sometimes you don’t necessarily need all that storage space under the sink and just the countertop is sufficient. That’s where this strong and sleek black counter comes in, which matches welll with the rest of your all black decor. The stark white sink stands out and breaks up that monotony of black. Sometimes, a simple and fuss-free design is all you really need to make a space look homey and warm. This strong and rugged looking concrete counter looks perfectly at home in this rustic looking bathroom, as its harshness is softened by the clever flowerpot placement and sink with rounded edges.